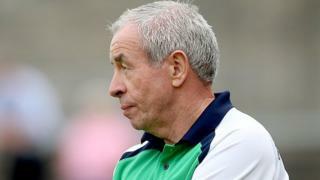 Pete McGrath salutes his Fermanagh players after they beat Westmeath to reach the All-Ireland quarter-finals. The 1-13 to 0-7 victory at Breffni Park put the Erne County into the last eight for the first time in 11 years. Tomas Corrigan took over as free-taker and ended the match with a personal tally of a goal and seven points.